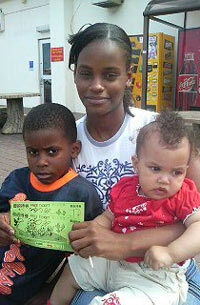 Toni Manthey is the winner of a ¥5,000 gift coupon to Hamid Care Center. Originally from Sioux City, Iowa, she has been on Okinawa nine months and likes it every day. When she is not exploring Okinawa’s beaches, she enjoys quilting baby blankets on her free time. Candice Figaro-Luk is from New Jersey and been on the island nine months. She says that “I love island life since I was born and raised in the Caribbean.” During her free time she often goes driving around the island with her husband. She also won tickets to Kodomo-no Kuni. Next week we will raffle away ¥5,000 gift coupon to Skate Shop AKB, and entrance tickets for three persons to Okinawa Kodomo-no Kuni park.